Filmmaker Maurice O'Brien writes for Culture about his new documentary, The Abbey: A Riot of Their Own - watch it here, via RTÉ Player. 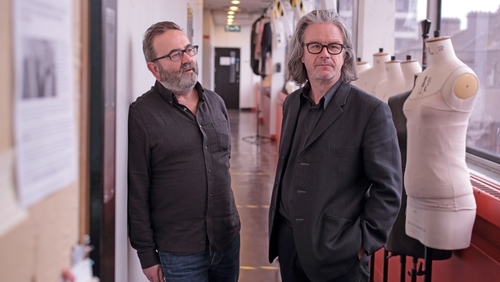 In early 2017, I had just moved home to Ireland after ten years living in Glasgow when a composer friend got in touch asking whether I’d heard about the two new Directors taking over at the Abbey Theatre. A pair of outsiders with a punkish sensibility, given one of the biggest arts jobs in Ireland with a mandate to refresh a revered national institution? Tell me more…. Listening to Graham McLaren and Neil Murray outline their vision for the Abbey and discuss the programme for their first year in charge, I was impressed by how down to earth, passionate and funny they seemed. Later on, their tag-team approach to running the Abbey Theatre as a partnership would be described to me as Graham (the Scottish one) being the ‘show’, and Neil (the Welsh one) being the ‘business’ side of the equation, although in reality they both do a bit of everything. But most impressive of all was the incredible list of shows which they were planning, and their ambition for what they thought the Abbey could become. Graham and Neil both previously worked with National Theatre of Scotland where the motto was ‘Theatre without Walls’ – and whose work I had hugely admired. After so long away, I too felt like I was seeing Ireland though fresh eyes, and was really curious to see how their philosophy would translate in relation to Ireland’s national theatre. And what better way to plug myself back in to the cultural lifeblood of the country than to peek behind the scenes as some of our best writers, actors and directors grappled with the madness of the world outside? It took a while for the Abbey to come onboard – hardly surprising given how busy they were with multiplying the theatre’s output. But when Tara Flynn’s Not a Funny Word opened at the Abbey’s Peacock stage in May 2017 I knew I had to film it. After that I basically just became a nuisance and, whenever work on other projects allowed, I would arrive in to the Abbey to film rehearsals and shows – slowly but surely getting to know the large family of creatives and backroom staff who make the place so special. As this was my first project for RTÉ, albeit after many years making arts documentaries for the BBC, I wanted to get a really strong trailer together to convince the commissioners that not only were the characters compelling but the work they were making was fantastic, as evidenced by the new audiences streaming to the Abbey. One particular highlight was tagging along as the cast and crew of Jimmy’s Hall decamped to Leitrim, having taken on the huge task of building a stage in a community hall to tell the inspiring story of James Gralton. As the first show he was directing himself since joining the Abbey, it was a risky move by Graham McLaren, who hardly made things easier for himself by next taking on the task of dramatizing Ulysses. After a year of filming, and with well over 120 hours of footage, the daunting task of editing finally began. Having seen her work on Portrait of a Gallery, another long-term project, I knew that Brenda Morrissey was the woman for the job. It was a pleasure and an education watching the leaps of faith and endless attention to detail as Ireland’s finest theatre actors and creative teams worked on scenes and brought the shows to life. And it was inspiring seeing first hand the ambition and struggles of the new Directors as they sought to realize their vision. I hope the viewers of our film will be just as captivated, and inspired to pay a visit to the Abbey Theatre themselves. The Abbey: A Riot of Their Own, RTÉ One, Tuesday, October 30th at 10.15pm.